How to Maintain Your Dental Implants | Benjamin S. Fiss, D.D.S. Dental implants offer the best solution to return functionality and aesthetics to a mouth with missing or severely damaged teeth. Implants replace the root of the tooth, while an abutment holds the tooth-like crown in place. While the titanium implants cannot deteriorate themselves, the bone and gum structure that holds the implant in place can, so practicing good oral hygiene is vital to the health and maintenance of your dental implants. Regardless of whether you have a single implant or many, proper hygiene is what will make them last. When not checked, bacteria can form around a dental implant just as it can around a natural tooth, and when bacteria are not removed, it can lead to an infection and the deterioration of the bone structure, which in turn will weaken the connection between the bone and the implant, which may result in the loss of the implant. To prevent this, dentists suggest the following practices to ensure that your implants are long-lasting. Brushing is the most basic and essential way to protect your teeth, whether they are natural or implants. A soft bristled brush should always be used when cleaning dental implants. The soft bristles will prevent the scratching of the crown and the irritation of the gums. These brushes can be manual or electric, and they should be used twice a day for at least two minutes at a time. Also, a low-abrasive toothpaste with no harsh ingredients or chemicals is recommended to preserve the surface of the crown and adjacent teeth. Flossing around your natural teeth and dental implants are the most effective way to ensure that there are no food particles or bacteria left in between the teeth or underneath the crowns of the implants. Although there is implant-specific floss, most unwaxed floss will get the job done. You want to make sure that you not only floss between the teeth but get all the way around the implant. In addition to traditional floss, a water flosser, such as the Waterpik® Water Flosser, can be an effective and comfortable way to get rid of any remaining particles. Teeth grinding is just as dangerous to dental implants as it is to your natural teeth. Bruxism leads to the breakdown of the implants and creates lasting damage to the bone structure. If you know that you are a teeth grinder, or are beginning to notice the signs of bruxism, wearing a night guard is essential to your implant maintenance routine. It is vital that at-home oral maintenance begins immediately after the implants are placed and continued long term. 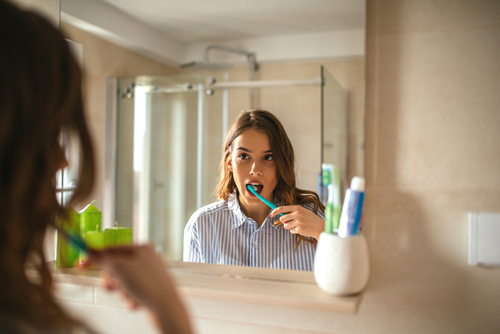 Even with proper at-home hygiene, visiting your dentist is critical for the maintenance of your implants and the continued health of your surrounding natural teeth. It is recommended that patients with dental implants visit their dentist four times a year for cleanings and routine check-up visits. To learn more about maintaining your dental implants, or if you are interested in getting dental implants, contact Dr. Fiss by calling (312) 951-5230 or by filling out our online contact form.